Launched recently, Poetry International Community Outreach Programs (PICO) are a series of writing and poetry workshops led by SDSU graduate and undergraduate students, held in collaboration with under-served or under-represented communities in San Diego. So far, PICO has led multiple workshops with the Sudanese American Youth Center and at Hoover High School. PICO will have a website soon and is having another SDSU graduate led workshop with SAYC in April. The following is a blog post of one workshop leader’s experience, Dean Robertson. When I first taught poetry in the classroom, I was a first year grad student interning for Border Voices. I was nervous to say the least; will the children like me? What if they don’t like poems? Will they pay attention? Am I going to have a panic attack? What if they hate me? Dumbfounded by their energy and enthusiasm, their unique and surprising images, the power of their words, and the happiness they exuded, my hesitations quickly evaporated. Kids like poems, and their imaginations alter the seemingly mundane, daily observations (like looking at the moon) into powerful and exceptional thoughts. Fast forward four years, and now volunteering with PICO, the same fears enveloped me: would they like me? What if they hate poetry? What if they hate me because I took away their Saturday? Again, these fears dissipated as four young women entered the classroom and were immediately engrossed in the exercises we provided. When I was interning with Border Voices, one of the experienced poet-teachers explained to me that sometimes teaching creative writing (especially poetry) to high school aged students can be difficult due to peer criticism and the difficulty of pulling students out of their shells, and the fact that volunteer poet-teachers sometimes become disciplinarians. I was expecting to work with students ranging from 10-18, but was not expecting to work with four teenagers; the caveat the poet-teacher explained to me four years before entered my mind and I thought that I would be spending the next few hours with the other PICO leaders pulling poetry out of them like a dentist pulls a worn tooth. I mean, it was Saturday, and my 17 year old self would not have been caught dead in a classroom. My thoughts were immediately altered; the young women were not only respectful, but were enthusiastic, invigorating, and ready to write. I lead the first exercise as an ice breaker with the surrealist game called the exquisite corpse. 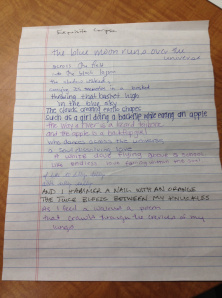 This game calls for a group of people to collaboratively create a poem by passing a sheet of paper in a circle. The first person writes three lines and folds over the sheet to reveal only the last line and passes it to the next writer. The next writer only sees the last line and contributes three more lines, folding the paper over again to show their last line. The writer then passes that sheet on to the next person until everyone contributes. I believe this exercise was successful; not only did it require each of the students to participate, but the PICO workshop leaders were able to get to know the other students who had already finished writing, or were waiting to write. Not only were we able to get to know them personally, but when we read the finalized poem, we began to know them poetically. We were able to create a community within minutes. We played a music game and ate snacks. The air seemed to lighten as each person added to the poem, and by the end, we had created a poem that would make any professional writer swoon. I was particularly jealous of the creative outburst of the quietest student in the room who did not read her work at all during the entire afternoon. However, since everyone contributed to the exquisite corpse, we were lucky enough to hear her words, her thoughts, her images. I hope that that experience helped her gain confidence even though she was reticent during the whole workshop. If so, I think we did our job trying to connect with her. If not, then at least we were able to experience her writing for an unfortunately short period of time. It is students like her that keep me coming back to teach, and I hope the experience she had will give her the energy to keep writing.